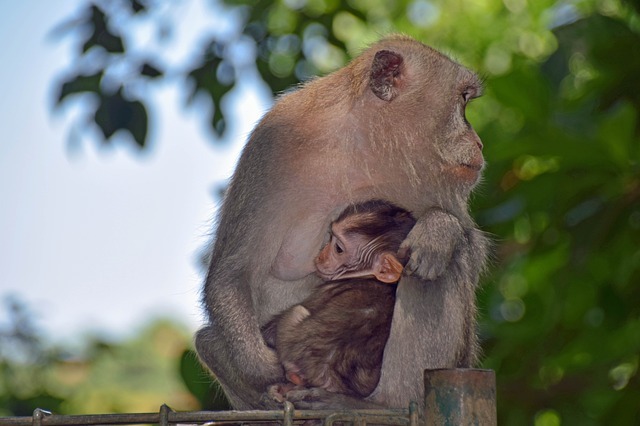 Bali Monkey Forest is a sacred animals sanctuary which inhabited by hundreds of Bali native local primates. And in scientific, type of these animals belongs into long tailed macaque classification that found a lot mostly in tropical countries. Specifically in Bali island, the existence of these local apes conservation often called Holy Monkey Forest. All monkeys that found in Bali are strickly protected by local goverment regulation also Balinese people really respected of them. definitely there is a sacred place inside, with it's main function commonly used by the Balinese Hindu society to express sense of gratitude to the God. Especially the existence of tropical forests that are giving greening contribution to the Bali island environment with its local primates that live peacefully in it. Uluwatu holy monkey forest cliff temple, located at Pecatu village, South Kuta, Badung regency. Sangeh monkey forest temple sanctuary, located at Sangeh village, Abiansemal sub-district, Badung regency. Ubud holy monkey forest temple, located at Ubud art village, Ubud sub-district, Gianyar regency. Bedugul area towards Singaraja north Bali direction. Pulaki holy monkey forest temple in west Bali. The animal of this native macacas found easily almost in every tropical forest in Bali. and Monkey young female around 4 to 8 Kg, while the Baby monkey approximately 350 Gr with black fur and crested head. The whole of monkeys found in this island strickly protected by law, besides according to the belief of Hindu society in Bali, monkeys are also classified into one of sacred animal, in addition of Cows, Geese, etc. All sacred temples that existed in every monkey forest found in Bali is strongly associated with the local knowledge of Balinese people, to express sense of gratitude also to appreciate jungles able to sustain balance of nature. Moreover, Balinese also strongly believe about Hindu epic story "RAMAYANA", explains about the presence of monkey's troops who helped "SRI RAMA". According to historical legend of epics Ramayana itself and based on archaelogical research is a true story occurred during the periode of "TRETA YUGA", happen in 1.750.000 years ago. And Ramayana story also tells about the huge construction of a long bridge called "Situbanda". A unique bridge shaped a "Curve", which is located at "Palk Strait" (between India / Ramesvaram and Sri Lanka), that made from pumice stone with length about 323 miles (600 Km). This is the bridge which made by Monkey's troops under strick supervision of Sri Rama who is the incarnation of God himself. Because of this belief, until now the existence of monkey forest in Bali (especially the monkeys animal) are highly respected by Hindu community. In addition, monkey forest also being used as a conservation, education and favorite tourist attraction, so then travelers who come to visit the place can freely walk around and do natural contact without interfere the monkeys animal. Another important thing that you should know, if you intend to visit monkey forest (Bali native animals), how you should always be aware to all your personal items, such as: glasses, all jewelries, hats, and other hand bags. Because unconsciously, all your belongings could be quickly taken by the monkeys. If you don't want to feed the monkeys, enough just keep your distance then open your hand. Because mostly monkeys will find out, if there is any food that you hide in your pocket, pants, or bags. and suddenly the monkeys will could jump on your body to find food. So our advice, please always to open your hand when walking around into the monkey forest as a sign that you are not carrying anything. and please always keep the distance, do not get too close to the monkeys, don't also made a strong eye contact when the ape animals approach you. This action is the most important, never once in a while to touch the body of monkeys, because monkey is a very sensitive animal, because most likely the monkey will attack you instantly. Even if you want to take any photos to the monkeys, please try to keep your distance and not get too close to them !. 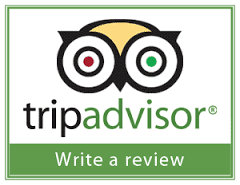 Finally...comes also to the end explanation of Bali monkey forest from us. So lastly how's your record? 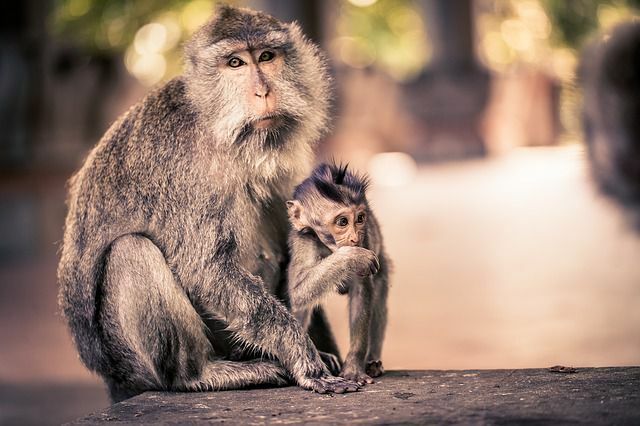 Can't wait to bring your whole family to visit and exploring Monkey forests whilst you do Bali holiday tour packages? Let's go together with us Sorga Bali Tours (Online organizer for holidays, Adventure packages and Bali tour service activities). For detail information and easy way how to do tours to visit Bali holy monkey forest temple also exploring other interesting places around whether for a half day trip or full day tour, Please Contact Us at Sorga Bali Tours.